I have thought that I would have the least fun in Phuket as I have had in Maldives. Due to the dates being pushed I canceled my stay in SALA Phuket and I was really looking forward to it! It wasn't much known to most people here in Kuwait and I had read great reviews on the SALA hotels especially the one in Phuket. We agreed to go there next time we visited Phuket. 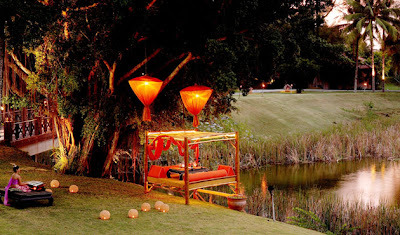 But after seeing our second choice, Banyan Tree, I'm not sure about that. Most of my friends tried to coax me to not stay there, mentioning it was "too far" from everything and it had no beach. 20-25 minutes away from Patong Beach was not that far! Having no beach, but the most amazing infinity swimming pool I've ever swam in was the best decision I've had. I chose the double pool villa! I think there is one more room that is pricier than this. But they call this their best villa. We have our own huge kitchen near the entrance of the villa. There's a hallway leading to the spacious half outdoor salah. Another smaller living room with a huge daybed, TV, writing desk, and mini bar. On the other side of the salah, was a door connecting you to the insanely huge bathroom complete with wardrobe area, shower that includes scrubs from their famous spa, and a bathtub adorned with fuchsia orchids. There was a door there that took you out to the garden where you had 4 tanning beds and a huge infinity swimming pool connected with its own modern jacuzzi. You can access pool through salah too. Outside the bathroom is a smaller hallway leading to the bedroom. Now here's the best part. The room was completely surrounded by another pool. It was all windows and you can swim or dine in the waters (there was an in-water chairs and table). you can access the pool through the bedroom itself. The service was amazing. Reminded me of the one we had in Huvafen Fushi.You have your own butler which you called through the Sony Ericsson cell phone that came with the room! He also drove us to and from the main lobby as it would never be achieved on foot. They provided us with bikes, but that was impossible to use when I wore my summer dresses! I used them once, our last day. It was so much fun! Then there were the complimentary gifts! OMG every time we got back to our villa there was a new surprise. The gifts were so big and heavy we had trouble putting them inside our luggage in the airport. They really made us feel so special and we really felt that this was the most incredible romantic place we could ever be in. Of course, I had made my reservations beforehand. 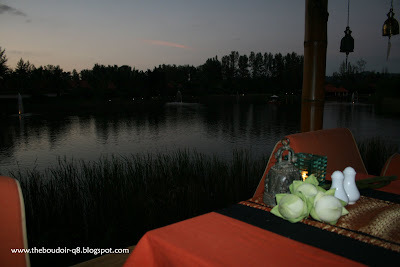 Especially the private dinner by the hotel's river! It was called "Dinner of Spirits". You have to try that. We had it at 6:30pm, because I wanted to go to Simon Cabaret, the 'ladyboy" spectacular show. The timing was perfect as it was at sunset. The food, which was all local, was so good, I still dream of having such great Thai food again. This last picture is the reason I'm so in love with Thai food. 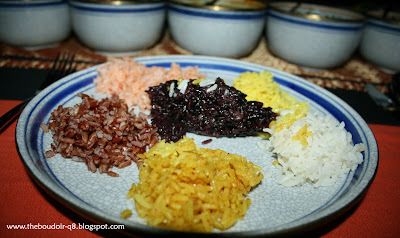 Different types of yummy rice. I especially love the black one, it tastes like coconut and is sticky. Tastes better when eaten plain. There's curry, turmeric & juniper, red rice with ginger tea, lemongrass, black sticky (my favorite), and watermelon (I didn't like the taste of this one though) rice. Accompanied by delicious dishes. The dessert was amazing too. Four tiny cups, each made up of a different kind of rice dessert. I have kept the menu as a memento of that day, *sigh*. but i definitely plan on going ! hab: it is miss it!